Victims reported packages stolen from at least three residences in the Spring Creek & Thornbrook neighborhoods. 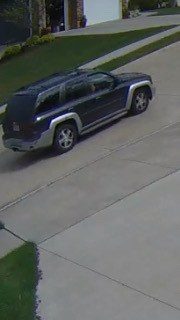 Video surveillance turned over to CPD shows this vehicle as a possible suspect vehicle in these thefts. If you have any information regarding the owner of this vehicle and/or anyone associated to this vehicle, please call CrimeStoppers at (573) 875-8477.